Among other things, her work will examine Christian attitudes toward Muslim dress and appearance and whether Muslims could engage in public religious expressions, teach Arabic to their children and maintain bathhouses, schools, cemeteries and other separate spaces important to the continuity of their culture and religion. “Over the period that my study covers, Christian attitudes changed dramatically about all of these things,” Constable says. Director of the University’s Medieval Institute, Constable specializes in the social, economic and cultural history of the Mediterranean world, particularly the Iberian Peninsula. Her current research focuses on the time between the 12th and early 16th centuries. In the century or so after the conquests, she says, Christians generally accepted the distinctive Muslim religious practices and ways of life. But over time, Christian attitudes became less and less tolerant. Out of several thousand applications each year, the Guggenheim Foundation selects approximately 5 percent as fellows, based on exceptional academic achievements and on continued promise of exceptional work in the future. Two of this year’s winners are from Notre Dame — both of them medievalists. 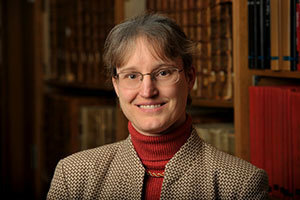 In addition to Constable, Margot Fassler, Keough-Hesburgh Professor of Music History and Liturgy in the Department of Theology and co-director of the Sacred Music at Notre Dame initiative, won a 2012 Guggenheim fellowship for her research on Hildegard of Bingen. “I think this is testimony to the strength of medieval studies at Notre Dame, to the strength of our medievalist faculty and to the support we get from the College of Arts and Letters,” Constable says. Previous Guggenheim recipients with ties to the Medieval Institute include Kathryn Kerby-Fulton, Department of English; Ann Astell, Department of Theology; and John Van Engen, Department of History. Originally published by Joanna Basile at al.nd.edu on May 17, 2012.